A couple of weeks ago, the Halloween decorations started to come out in our neighborhood. This is our first Halloween in this house, so I wasn’t sure what to expect but it became apparent pretty quickly that the bar is pretty high — at least in the little cluster of houses we live in. 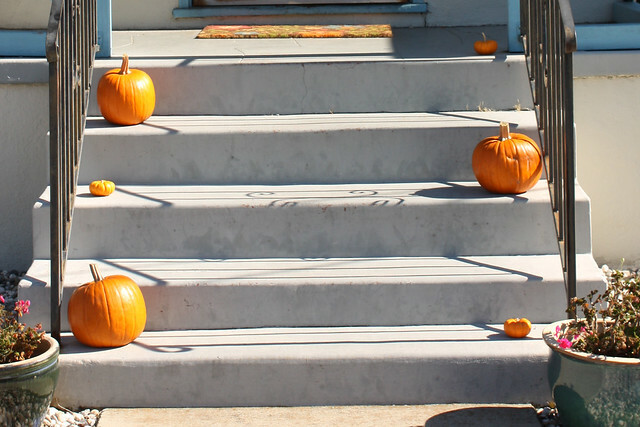 At our old place, most people on our block put a pumpkin on their porches, but that was about it. Now we live among some decorators! They’re not converting their front yards to full-on haunted houses or anything too over-the-top but they are definitely having a little fun. Our neighbors to the left, have a carefully selected assortment of fall foliage, pumpkins and a decorative flag, while the neighbors to the right are super spooky with skeletons, gravestones and a giant spider climbing up the side of their house. I decided we’d better step it up! Lucky for me, Augie has started bringing Halloween art projects home from preschool: a ghost windsock, a giant pumpkin and a smaller, freaky pumpkin man. Wyatt decided that Augie’s art wasn’t scary enough, so he made a series of signs and hung them up. 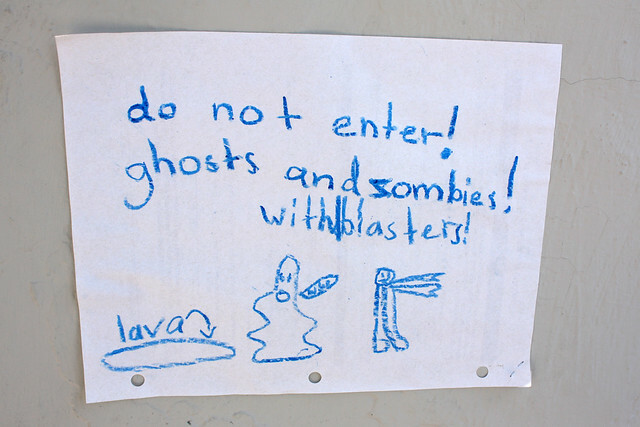 One of my favorites was this sign alerting visitors to the lava pit and the ghosts and zombies with blasters that are lurking behind our front door. 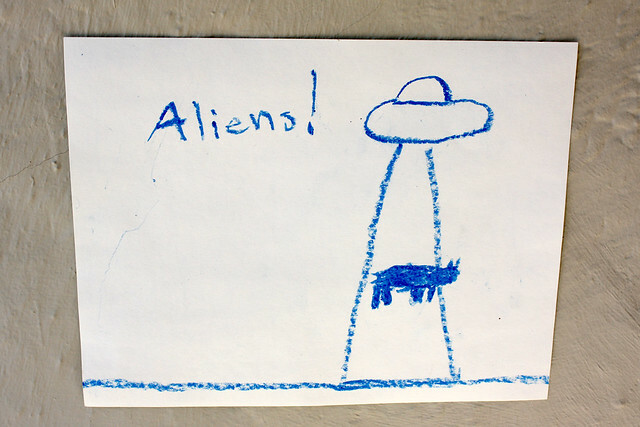 I also love this “Aliens!” sign. How cool is that cow getting sucked up into the flying saucer. 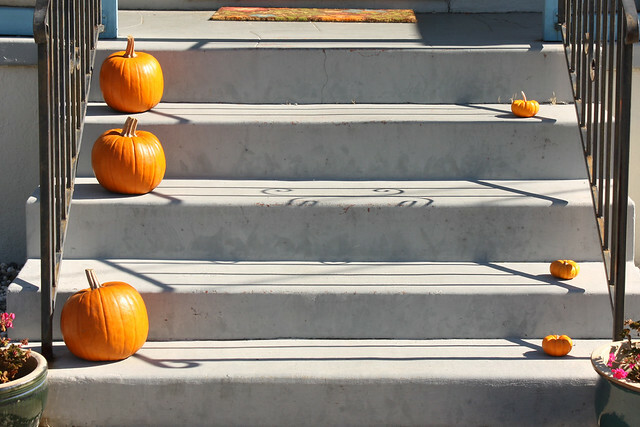 My contribution was a selection of pumpkins for the steps. This has provided me with endless amusement because the boys have very specific opinions about how they should be arranged. Augie prefers a symmetrical arrangement with all the big pumpkins on one side and the little pumpkins on the other. On the other hand, Wyatt likes them to be evenly mixed with the big and little pumpkins zig-zagging back and forth. Every day when the kids come home from school (at different times) they look at the pumpkins, throw up their hands in exasperation and undo what the other brother did when they weren’t looking. Wyatt is always baffled, putting his hands on his hips, shaking his head and asking “How did these get messed up? I just fixed them yesterday!” While Augie is enraged, “No! No! No! Big punkins on dis side!” I finally explained to each of them what’s going on and now they are having good fun with it, switching them back and forth when the other has his back turned. How are you decorating for Halloween? 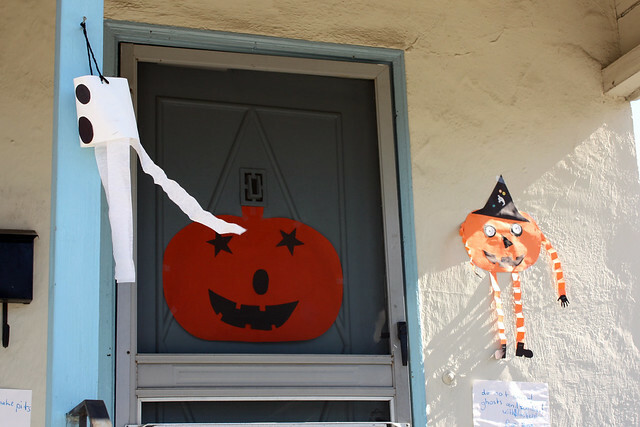 Do you go spooky, Martha Stewart-y, or do you focus on kids art like we do?